Before the American Revolution, America was without a permanent military. At the time, they relied on small militias. Unfortunately, after 15 years of peace, many of the militias became social clubs that were known for excessive drinking. The minutemen would soon change all of this, returning discipline to the ranks. Then as the embers of revolution burned brighter and brighter the minutemen in some towns began training as often as 4 times a week. Among the best trained was the Concord militia which required its men to enlist for a period of 10 months. They trained between 2 and 3 days a week. 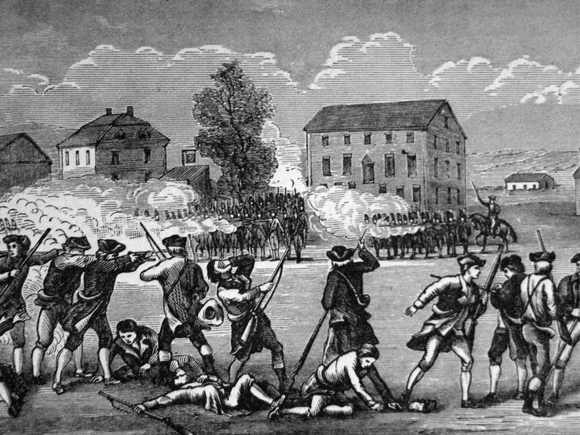 During this extensive training the minutemen learned how to move as a unit. At the same time they learned to obey 50 separate orders. The minutemen were each given a musket, bayonet, and 30 rounds of ammunition. Historical records tell us that by 1775 only half of them had bayonets, and that many preferred hatchets, a weapon they had seen the Indians used quite effectively. Approximately, 30% of the Minutemen were veterans, having fought in the French Indian War. Minutemen practiced volleying in ranks, the front row knelt on one knee, as the other two ranks fired standing. They shot until a drum beat told them to stop. On June 14, 1775, on the eve of the Revolutionary War, the Continental Congress established the Continental Army under the leadership of General George Washington, Commander-in-Chief. Soldiers in the Continental Army were paid $7.00 a month. Congress specified that their uniforms be brown. However, most wore civilian clothing until shipments of uniforms begin arriving from France in 1778. The uniforms had brown and blue coats with red facings. It was not uncommon for them soldiers to go barefoot. The cost of the uniform was deducted from their check. At first they used every size and shape gun imaginable. However, with the support of the French government and some American arms makers, the chief weapon became the flintlock musket with an attached bayonet. The muskets shot a lead ball in a paper cartridge that had been prepared by the shooter. Muskets had a range of no more then 100 yards. At this time efficient and rapid volley firing determined the outcome of most battles. Soldiers were taught to load an fire 15 times in 3 minutes and 45 seconds, or about once every 15 seconds. At the beginning of the Revolutionary War American soldiers had had very little experience using artillery. This was because the Indian Wars had been fought in areas of vast wilderness, and artillery was far to cumbersome. By 1775, foundries in both Pennsylvania and Massachusetts were casting cannons. Then, a couple of years later the Americans would start receiving artillery from the French. Civilians were usually hired to transport the cannons to the battlefield. The military camps of the Continental Army were deplorable. The winter of 1780 was especially hard at Valley Forge. The soldiers were forced to pitch their tents on ground that was hard ice. Making things even worse was the fact that they lacked winter clothes, and making things even worse the cold winds blew through the crevices of the huts that they had built for shelter. They also lacked food, and dysentery and disease was everywhere. At the same time, no one wanted to be taken prisoner because the conditions were even worse in prison, and being captured meant certain death. A few Continental regiments stood out during the Revolution. Washington had watched as entire regiments fled in the face of danger, but Haslet's Delewares and Smallwood's Marylanders had stood firm in the face of the enemy. They would fight battle after battle for years until the war's end.